I dusted down my Curlformers to do something different with my hair this week. 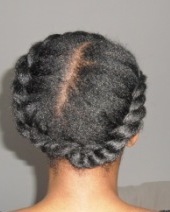 My intention is to use the curls to create a protective style that will last all week. As I’ve written about Curlformers before I won’t waffle on about the process. Instead I will illustrate what I did with pictures. As you can see I’ve got some good curl definition to play around with. I will use each curl as though it were a strand of hair to create my style for the week.